Controlling Progress children by default makes it only easy to add children to a Progress instance, but removing is not possible by default. This could have been useful when you want to use a single Progress instance which can have different children over time. Using a custom class MutableProgress makes this possible. The NSProgress instance which is renamed to Progress since Swift 3.0, is the main class to use for progress reporting in Swift. By managing the children by ourselves we’re able to control the children and add the possibility to remove children. // Remove the Video upload progress, as the video file has been deleted by the user during upload. By doing so, we need to make sure updates are broadcasted correctly. 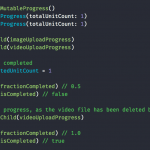 Therefore we need to override the properties fractionCompleted, totalUnitCount and completedUnitCount. Progress is using key value observation internally. Using willChange and didChange adds compatibility with UI elements like the UIProgressView. /// Removes the given child from the progress reporting. /// - Parameter child: The child to remove. By using a simple extension it is easy to verify if a Progress instance is completed. You can try it out easily using a playground and including the MutableProgress there. You can find the custom MutableProgress class here.